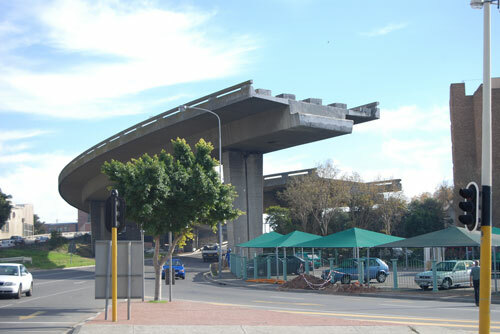 In the centre of Cape Town, South Africa, the government has built a bridge to nowhere. Originally, conceived in the 1940s, the Freeshore Freeway project was repeatedly hampered by squabbling among different levels of government, clashing egos, and conflicting expert opinions on planning and design. Construction began in the 1960s but was halted (urban myths abound as to exactly why) and to this day, the freeway remains suspended and incomplete. The absence of diligent research, long-term planning, and public involvement in a significant capital project have left behind a towering monument to the fact that government sometimes makes big mistakes. Street Health is joining with several other concerned agencies to actively oppose a comparable mistake being constructed right here in Ontario [scroll down for more info]. In January, 2013, the government of Ontario is planning to discontinue the Community Start-Up and Maintenance Benefit (CSUMB). For roughly 16,000 people per month in this province, this funding helps to construct bridges to escaping homelessness, harm, and insecure housing. The CSUMB is intended for those on social assistance (who are already vulnerable) to pay for moving expenses, purchase furniture (beds, lamps, chairs, microwaves), pay rent or utility deposits, buy special items that assist with a disability, pay rent arrears to prevent eviction, and any other items necessary to get or maintain housing. This is not a shopping spree; approval requires that one submit a detailed list of needed items, and their estimated costs. An individual is eligible for $799, a family $1500, once every two years, or more often if under exceptional circumstances. These circumstances include being a victim of fire or flood, having to move to supportive housing due to a disability, moving to escape domestic violence, replacing furniture due to bedbug infestation, or where denial of the benefit would be harmful to the health and welfare of you, your spouse, or your children. A woman and her children, fleeing a violent or abusive situation, can move to safety with this benefit. A struggling family can prevent their hydro from being cut off this winter. An at-risk senior with Alzheimer’s can move to supportive housing. Someone with a disability, who can’t carry heavy boxes, can hire movers to help. A basement apartment floods; a fire starts in someone’s kitchen. If you’ve finally found a job, and must move closer to your work, you can seek funding to help build a brighter future. If you have been discharged from an institution (a mental health facility, perhaps), where your basic needs were provided, you can bridge the gap toward more independent and empowered living. These are real-life possibilities. Social Assistance benefits were gored in the 1990s, the (sometimes medically needed) Special Diet Allowance was slashed, and assistance rates have been consistently outpaced by inflation –their spending power now reduced by 60%. But, throughout this, the government has always recognized that the CSUMB was essential to housing, health, safety, and that it respected the social determinants of health…up until now. In advance of the proposed January 1st, 2013 cut-off date, Street Health is partnering with other organizations to turn collective opposition into concerted action, on behalf of some of the most vulnerable citizens of Ontario. We are joining protests, advising our clients, contacting the media, and requesting meetings with MPPs and Ministers responsible for everything from women’s issues to seniors issues and, of course, Community and Social Services. At 10:00 a.m. on October 17th, 2012 (U.N. International Day for the Eradication of Poverty), the Ontario Coalition Against Poverty will host a CSUMB Walk-In Clinic at the Church of the Holy Trinity, 10 Trinity Square (on the west side of the Eaton Centre, south of Dundas). People on OW or ODSP are encouraged to attend and apply immediately for available benefits, before the dead line [sic]. Directly following this (12:00 noon) will be a meal, rally, and march on the provincial government to demand a reversal of this myopic budgetary decision. Similar protests are taking place in Kingston, Sudbury, Ottawa, Kitchener, and across the province. The Income Security Advocacy Centre (ISAC), and other legal clinics, are launching public awareness and lobbying campaigns. All of these initiatives need volunteers and support; we hope that you will help if you can.
. Above all, those who will be most negatively affected –who will bear the cruelest costs of homelessness- will be the women, children, seniors, disabled, unemployed, and poor who have had their basic needs, exceptional circumstances, health, and welfare deemed insignificant by a distant political process. Austerity measures are pushing the poor under the bus, and these cuts would push them from their homes…out under the bridge. As of September 2012, the city of Cape Town, South Africa is partnering with the University of Cape Town to “further study options for how to complete the [Freeshore Freeway] bridge”. Over 70 years ago, a government’s bad decisions, poor planning, and short-sightedness lead to the construction of a real, concrete mistake. However, and most importantly, they still can’t figure out how to fix it! Please help the people of Ontario prevent a comparable mistake from happening here. Your email will be directed to John Milloy, Minister of Community and Social Services, Kathleen Wynne, Minister of Municipal Affairs and Housing, and Dwight Duncan, Minister of Finance.